This is great for seances or magic shows! A beautiful Japanese foulard is also supplied! An attractive wooden table that is used during the performance as a prop, then becomes a mind blowing effect! 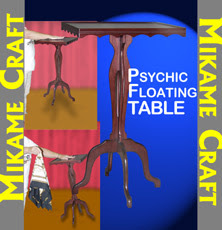 The magician covers the table with a Japanese foulard and both hands are shown to the audience. 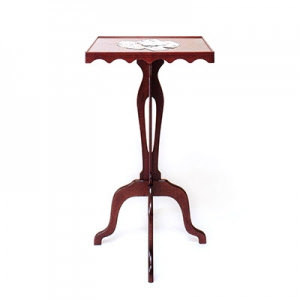 Now the magician places his palm down onto the table and it begins to rise and rise upwards into the air! The table then comes to a rest. The magician can freely show his hands and then once again cause the table to not only defy gravity but also dance in a circular fashion, and move from side to side! Finally while the table is still floating it comes to rest and the magician removes the tables' cloth and walks away. No threads or magnets! No Zombie gimmicks! You can even perform this one surrounded! Unit A8, 18/F, Richwealth Industrial Building, 144-146 Yeung Uk Road, Tsuen Wan, N.T.